Editorial by New Mexico Foundation for Open Government President Greg Williams. 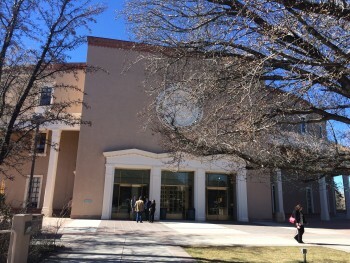 Closed-door budget talks and a failed effort to create a transparent ethics commission largely shaded the recent New Mexico Legislative session from sunlight, but 2016 did see two incremental victories for transparency. Sunshine Week is March 13-19, 2016. The Sunshine Week campaign works nationwide to celebrate transparency and emphasize the value of open government. Here at home, the New Mexico Foundation for Open Government (FOG) is leading the crusade against secrecy in government and politics. Our primary mission is to educate, advocate and enforce our state’s sunshine laws – the Inspection of Public Records Act and the Open Meetings Act. FOG routinely encounters reports of elected officials holding secret meetings and citizens being denied access to public documents. FOG often finds that government entities in New Mexico either don’t know their responsibilities under our sunshine laws, attempt to bend the rules or ignore them. And unfortunately, sometimes that includes our State Legislature. Perhaps no issue was of greater importance in this year’s legislative session than our stripped-down budget. But when the House Finance and Appropriations Committee closed its meetings to hash out details of the budget, the public was locked out. After receiving complaints, FOG issued a letter to the House and Senate leadership, but neither chamber responded to our appeals for openness. And even in a year marred by scandals, some lawmakers dug in their heels when faced with a choice between maintaining the status quo or embracing a proposal to create a more transparent, independent ethics commission. The Senate Rules Committee rejected certain transparency provisions governing the proposed commission, not recognizing that an ethics commission, like any public process, only works when it is conducted in the open. But all hope for sunshine is not lost. During the 2016 session, Rep. Jeff Steinborn’s resolution to archive House webcast footage was passed. This new practice will increase participation in government by allowing citizens the opportunity to watch House floor and committee meetings at their convenience. It will also ensure that we have a historical record of House proceedings. Additionally, Rep. Jim Smith and Sen. Daniel Ivey-Soto successfully sponsored HB 105 to improve campaign finance and lobbyist reporting on the Secretary of State’s website. The bill requires that data be maintained in a downloadable, searchable and sortable format so that journalists and the public can accurately follow the money. The measure was passed by both the House and Senate unanimously and signed into law by Gov. Martinez. While sunshine wins like these represent real progress, the battle for transparency seems never-ending. Our state has critical problems, and to solve them, our government must function at its highest level – for which openness is essential. When officials resist reforms that would empower citizens with information about our government, we all suffer. So, for the good of our state, FOG encourages every official to hold sunshine high among their priorities.